Many serious golfers would scoff at the notion of disc golf, but if you have ever played the game, you probably understand why it has such a huge following. Played much like conventional golf– using floppy disks (think of a thin rubber Frisbee®) instead of clubs and balls, disk golf follows the same basic set of rules we see in regular golf. Although the ‘tee’ is usually a mark on the ground where the disk thrower stands, and the ‘hole’ is usually a metal basket attached to a tree, the idea of the game is the same. Golfers toss a ‘put’ toward the hole, mark where it lands and wait for teammates to do the same. Each hole is marked with a par, and players record their score in the same manner as regular golf. The game is made more or less complicated by the layout of the green, which are usually much less formal and meticulously groomed than conventional golf greens. Disc golf greens can often be found in city parks, but people have been known to create their own when one is not available to them locally. Most courses have of 18 or 24 holes, and a few smaller ones have nine. Hole lengths fluctuate from green to green, but you can expect them to have distances of about 150-500 feet each. Trees, brush, lakes or streams and the general landscape of the park offer plenty of hazards to avoid. 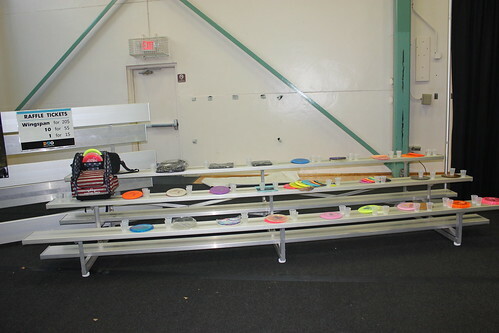 Disc golf rarely costs more money than what you have to pay for the disk itself (usually $7-$15) and one can easily play a whole round using just one disk, although discs are available in varying weights and colors for the serious player. Do not however expect to use a regular plastic disc to golf with.